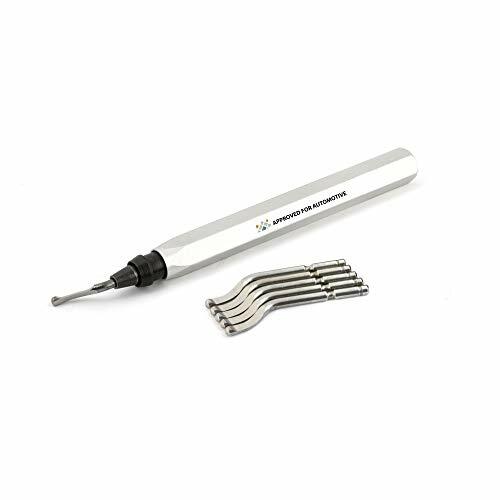 VERSATILE HAND DEBURRING TOOL - Designed for purposes ranging from DIY projects to professional industrial applications. ENABLES EFFORTLESS FINISHING - Carries out rough to extra fine deburring operations with perfection. Works on Metal, Plastic, PVC, and many other surfaces. Acrux7 provides 3 type blades for different needs. 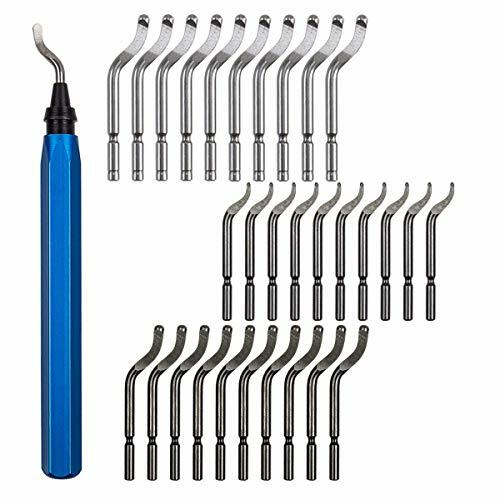 These tools are available for deburring cross holes, deep holes, straight edges, curved edges. HSS blades could efficiently remove burr for plastic, PVC, copper, aluminum and other soft metal. Cobalt added HSS blades are strong enough for stainless steel. It is easy to install blade by compressing the mounting head. The installed blade could be flexibly 360 degree rotated. It is very sharp and easy for burr removing. Please be careful and make it away from the kids. 43mm-Blades /Black / HSS high speed steel /5 pack, Suit for (diameter <1.5mm) hole and clip clean. 47mm-Blades /Silver / HSS high speed steel (Containing cobalt for strong cutting) /5 pack, Suit for Stainless Steel. Aluminum alloy Handle /Pen & Hex shape /1 Pack(No Blade), It is comfortable to hold and good for you to focus on your works before your workbench. It is easy to install blade by compressing the mounting head. The installed blade could be flexibly 360 degree rotated. It is sharp and easy for burr removing. Please be careful and make it away from the kids. Long reach extension gets into hard to reach spots to remove burrs and flaws in any fine detail work where deburring is required. Safely remove plastic, metal and wood burrs from any surface. 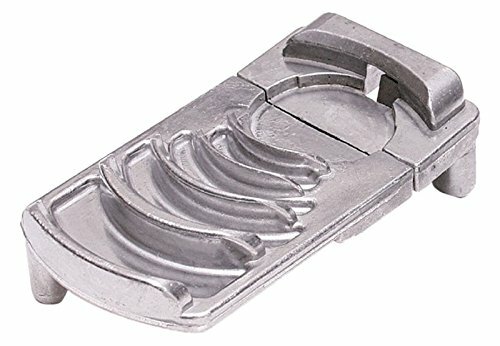 Must have tool for hobby enthusiasts and 3D printing. 5 BS1010 blades for removing steel, brass and aluminum. 5 BS1018 blades for hard cutting stainless steel, tungsten and other hard metals. 5 BK3010 for cast iron, brass, copper, wood and ABS plastics. Wide body deburring tool allows for not only blade storage but a comfortable grip that enables long use without discomfort. Ideal for any 3D printing jobs where perfection is required. The extra sharp BK3010 blades quickly remove burrs from nylon, ABS and PLA without melting the filament. Deburrs: Steel,aluminum and plastic.Set contains 1pcs. - NogaGrip 1 handle. 10pcs. - S10 blades. Pack dimensions: 169x117x26mm. -NG-1 Handle (NG1000) S10 Blade (BS1010) WARNING: This product can expose you to chemicals which is [are] known to the State of California to cause cancer and birth defects or other reproductive harm. For more information go to www.P65Warnings.ca.gov. 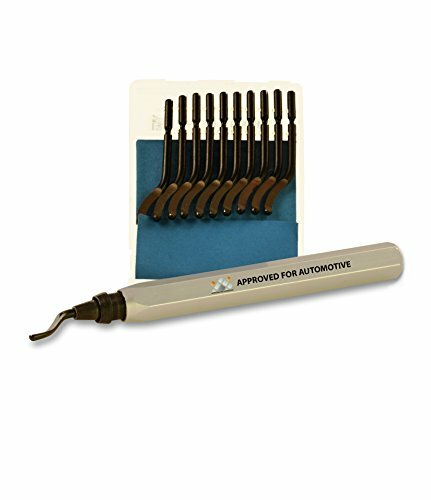 This deburring kit by Approved for Automotive is the ideal solution for all your deburring related tasks. 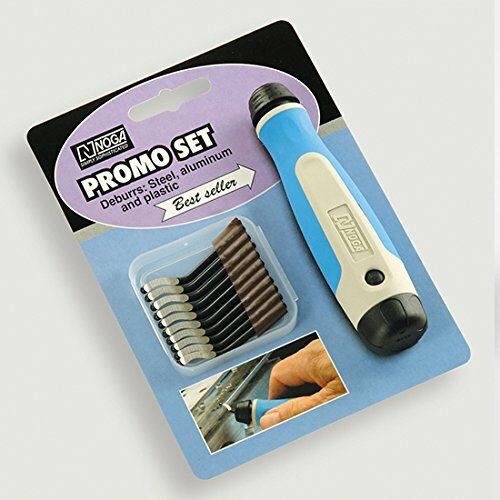 The kit consists of 1 hand held deburring tool with 3 kinds different blades. The tool easily holds all heavy-duty, 3.2mm, swivel head blades. Suitable for home use, plumbing applications or as a professional workshop tool. 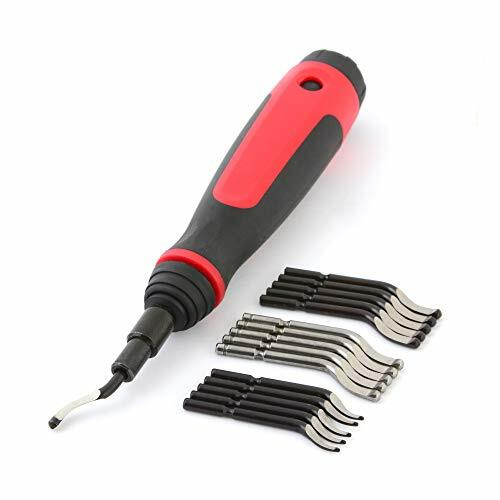 For example, you can use it for removing burrs from cut pipe, tubing, conduit, and PVC tubing thus making it a great pipe deburring tool. The tool can be used for cross holes, deep holes, straight edges and curved edges. The small size of the tool makes it really easy and convenient to carry around. The blade is easily replaceable and with multiple blades at your disposal you can carry out deburring with ease and precision. These blades are made with tempered high-speed steel . This deburring tool kit works for steel, copper, aluminum and plastic. Machining position: the circular hole edge, straight edge, curved edges. Not suitable for outer edges, flat. 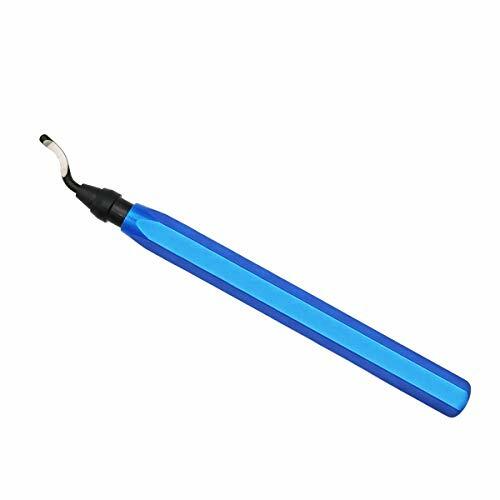 Flexible to Use:The blade is mounted on the handle can be rotated 360 degrees; they are small size, you can carry anywhere, you can replace the blade by pushing button. 5pc BK3010 for Plastic Trimming Blade: HSS high speed steel, blade diameter 3.2MM, oblique angle: 45 degrees. Suitable for (diameter <1.5mm) hole and clip clean. 5pc BS1018 for High Strength Trimming Blade : HSS high speed steel. Containing CO (cobalt) elements for strong cutting ,blade diameter 3.2MM,oblique angle: 45 degrees. Suitable for stainless steel, alloy steel and most of the workpiece trimming operations. FOCCTS Burr Trimming Cutter--360 Degree Rotated! With 360 degree rotation,the blade of this metal deburring cutter is gonna meet all the angles,especially the hard-reach corner. Rotating blade ensures complete 360 pipe rim coverage,which gonna make it possible even in a limited space. Ensures airtight connection between pipes and fittings, as well as maintaining clear, obstruction-free airflow. The blade is incisive,please be careful when using and keep it away from the kids. Sharp & Durable Blades -The blades are made of tempered high-speed steel, which makes the edge sharpness and blade hardness and toughness excellent. Hardness:62-65HRC, long-time using hand deburring tool for you! Perfect for cutting the circular holes edge, deep holes, straight edge, curved edges. HSS blades could efficiently remove burr for PVC or ABS pipes, Soft Metal(Aluminum, Copper) and Wood. Blades could be quickly changed and installed on the rotary mounting head. Features: Durable HSS blades, handle included to match with the blades, swivel blades, small portable size. These deburring blades suitable for deburring aluminum, copper, plastic, PVC, etc. 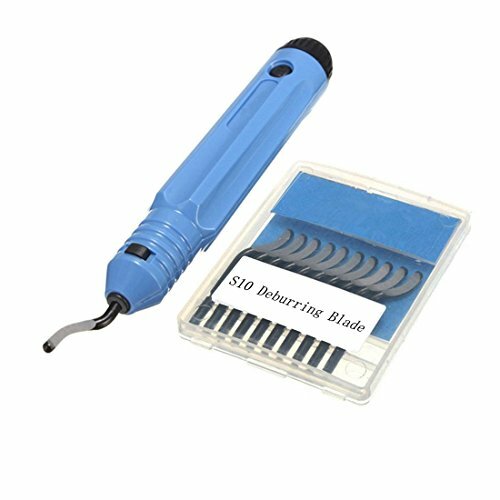 Deburring Tool NB1100 Handle with a Blade + 10pcs Extra BS1010 Deburring Blades. Blade Sizes: 47mm x 3.2mm (L*D), Handle Sizes: 125mm x 22mm (L*D). Deburring Blades Features - Model: BS1010; Material: M2 HSS; Angle: 40 Degree; Hardness: 63RC. Sharp cutting edge for cutting, machining surface higher smoothness. 1 x Deburring External Chamfer Tool Please allow 1-3mm errors due to manual measurement. Item color displayed in photos may be showing slightly different on your computer monitor since monitors are not calibrated same. EXTERNAL CHAMFER EFFECTIVE ON: Stainless Steel, Hardened Steel, Mild Steel, Copper, Brass, Aluminum, Fiberglass, Wood, Plastic. Reed Manufacturing, since 1896, is family-owned and operated, producing quality pipe tools and vises. Reed has developed many of the most innovative and effective tools in the industry. 6-1/2" Deburring tool with hexagonal, anodised aluminium handle and bayonet fitting. For removing burr from steel, aluminum, copper, brass and plastic pipes. Ordinary Trimming Blade: HSS high speed steel. Hardness: 62-64Rc, blade diameter 3.2MM. Use of purposes other than deburring may cause damages or accidents. 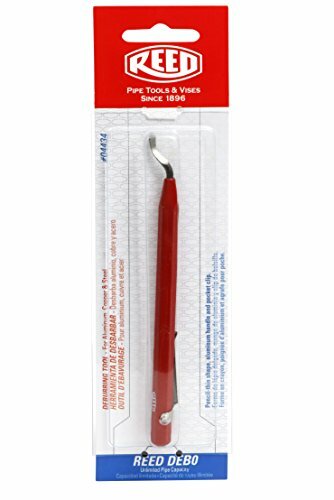 Be sure to check the deburring tool before use.Do not use until it is repaired or replaced when it is out of order. Do not touch blade section during operation. 1.Holde the grip and apply the blade to the inside of the frame. 2.Turn at least one full turn while keeping the blade in the direction of the frame. Simultaneously removes burrs from both sides of sheet metal. DB Handle with safety guard to protect your hand. Unique round cutting blades can be rotated and reversed for long life. For corners, use one blade only. Range: 0-12mm. WARNING: This product can expose you to chemicals which is [are] known to the State of California to cause cancer and birth defects or other reproductive harm. For more information go to www.P65Warnings.ca.gov. 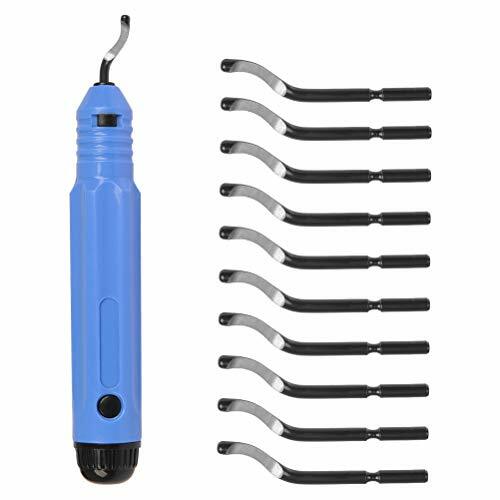 The deburring external chamfer tool is great for removing burrs and ridges from pipes or threaded rods, quickly repairs damaged bolts and tightens the nuts in place. It is suitable for use on metals including stainless steel, hardened steel, mild steel, copper and brass, as well as wood, fibreglass and plastic. 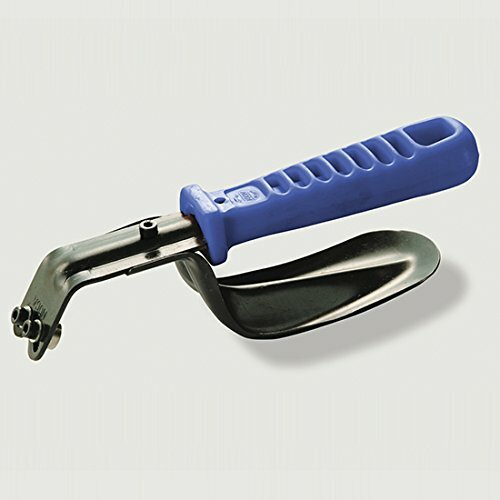 This chamfer tool is designed to help prevent sparks, burns or cut hands. When used properly, the tool does not overheat the work piece. Threads are sheared off, not folded over as may happen when using a grinder. 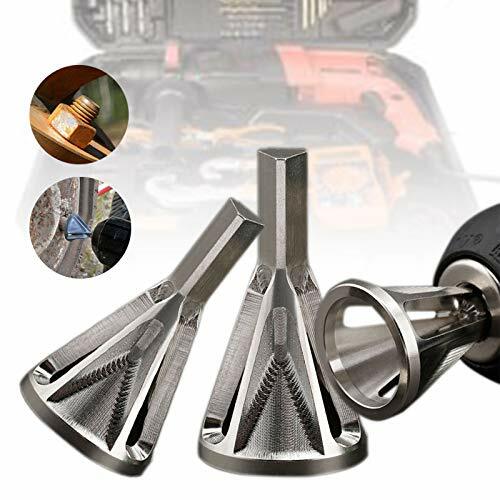 The deburring drill bit simplifies the repair process, eliminates the need to replace expensive or hard-to-find hardware. And it is convenient to use and durable, save more than 80% time. 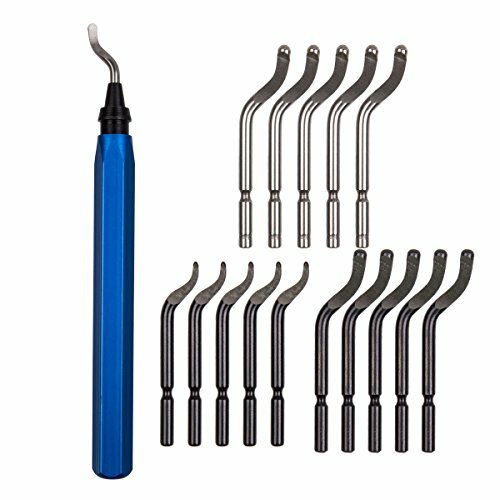 The deburring tool is made of stainless steel, high strength and hardness. It fits 8-32 bolts (.164) through 3/ 4 (.750)-10 inch-(4 mm-19 mm). Simple operation, using the lowest speed on the drill bit, and then slightly applying pressure to remove the burr. This will be a perfect Valentine's day Father's or birthday gifts for him. Suitable for: PVC, hard plastic and iron. 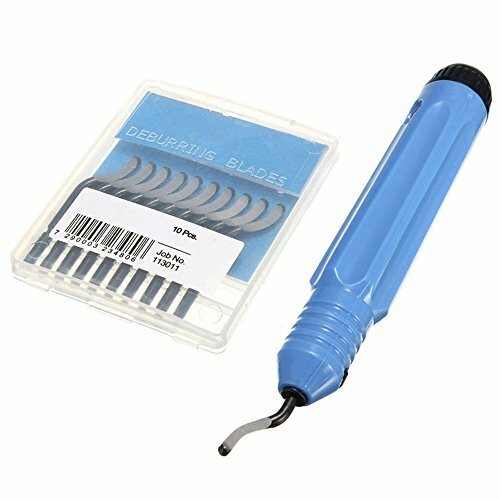 Plastic burr handle with 10 cutting deburring tool for NB1100 blades BS1010. Suitable for PVC, hard plastic and iron. Deburring blade, manual operation, easy to use and flexible. 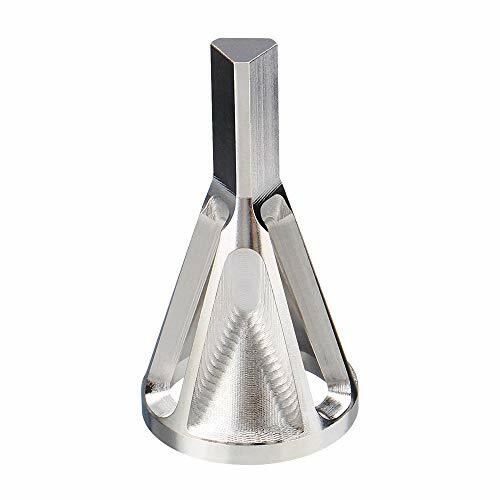 These tools are adopted sharp cutting edge for cutting, machining surface are high smoothness. The blade is mounted on the handle can be rotated 360 degrees; they are small size, you can carry anywhere, you can replace the blade by a simple push button. The SHAVIV B10S blade is made from high-speed steel with cobalt for longer tool life than B10 blades for deburring on steel, stainless steel, aluminum, copper, and plastic. It can be used with the SHAVIV Mango handle and blade holder style B or M (sold separately). The blade is designed for deburring straight edges and hole edges. Deburring cutters are hand tools used to remove sharp edges and small unwanted bumps, also known as burrs, from material. The cutter typically consists of two pieces: a handle and a blade. 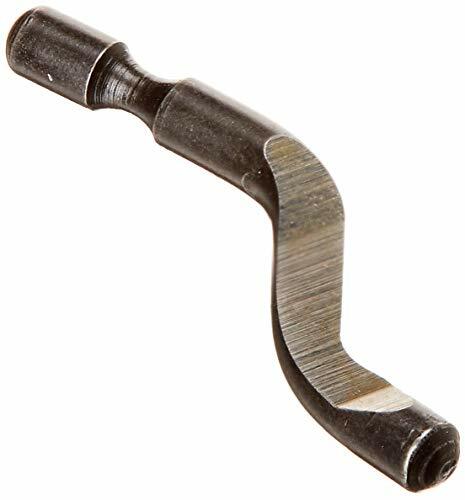 The handle holds a blade that is typically made from high-speed steel, carbide, or ceramic, and may have a coating to extend its life or for work on tougher materials. The blades have different designs for deburring in a range of applications, such as straight edges, hole edges, through-holes, slots, and corners. A blade holder can be connected to a handle to hold the blade for long-reach work. Vargus manufactures cutting, grooving and deburring tools under the Vardex, Groovex, and SHAVIV brand names. The company, founded in 1960 and headquartered in Nahariya, Israel, meets International Organization for Standardization (ISO) standard 9001:2000. The SHAVIV B10 blade is made from high-speed steel for deburring on steel, aluminum, copper, and plastic, and can be used with the SHAVIV Mango handle and blade holder style B or M (sold separately). The blade is designed for deburring straight edges and hole edges. 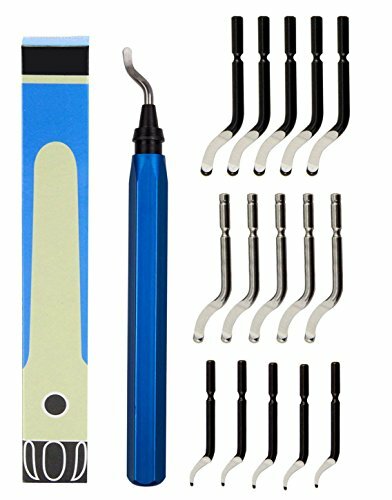 The SHAVIV 151-29066 Classic SHAVIV Deburring Kit B includes one aluminum A handle, one B blade holder, and two B-series blades for long-reach deburring of hole edges and straight edges. The aluminum A handle is lightweight yet strong and durable, and accepts all SHAVIV holders for long-reach applications. The SHAVIV B blade holder holds SHAVIV B-series blades and can be used axially or perpendicular to the material. The kit contains one B10 blade and one B20 blade. The B10 blade is made of high-speed steel for use on steel, aluminum, copper, and plastic. The B20 blade is made of high-speed steel for use on brass, cast iron, and plastic. It rotates clockwise as well as counterclockwise. REED offers deburring tools for plastic pipe. DEB2 deburrs inner and outer edges of PVC, CPVC, ABS, PP, and PE pipe through 2 diameter. 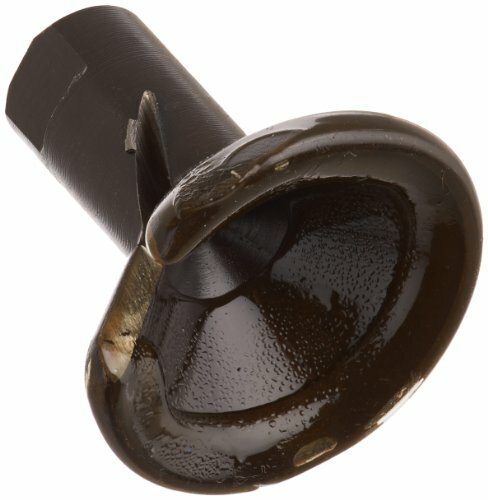 Made from steel, the Cone design allows it to be used on even the smallest pipe, including 1/8 diameter. DEB4 deburrs fast one easy revolution produces a 3/32 15 chamfer in seconds. This aluminum die-cast deburring tool features a hardened steel blade that is reversible for two cutting edges and sharpenable. DEB4 fits comfortably in one s hand and creates a smooth chamfered pipe end so solvent spreads evenly as pipe is joined. Deburrs six pipe sizes: 1 1/4 through 4 . used on PVC, CPVC, ABS.